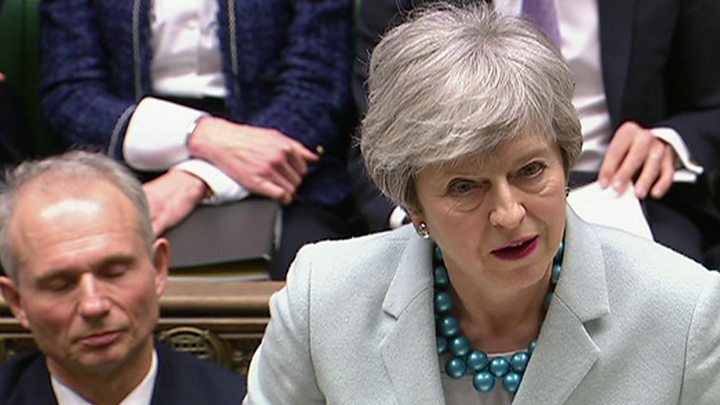 The prime minister does not display emotion very readily, with the possible exception of evident exasperation at the refusal of the House of Commons, collectively assembled, to endorse the deal she and others negotiated with the European Union. However, scrutinising her words this afternoon, I suspect she appreciates that she mucked things up when, last Wednesday, she appeared to castigate parliament and parliamentarians for that refusal. While in the by-going seeming to set herself apart from such blame. No doubt part of her calculation with regard to this matter has been the revived bout of speculation as to how long she can remain in office. But sorry still seems to be the hardest word. Theresa May was chastised for her comments by the Labour leader Jeremy Corbyn who warned that they were "dangerous and irresponsible" in that they might foster those who are only too keen to pursue routes other than those which are democratic or parliamentary. Further, she was explicitly challenged to apologise by Ian Blackford of the SNP and, later, by Pat McFadden, now a Labour MP for Wolverhampton and former Minister, but previously still a sagacious adviser to the late Donald Dewar. Mr Blackford said she was guilty of "Trumpesque" populism. Mr McFadden said she risked stirring up right-wing anti-democracy. On both occasions, the PM sidestepped this request. One could see her wrestling with the prospect but, in the end, she could not find the words nor expend the appropriate emotional capital. She pleaded for understanding, arguing that she had simply intended to stress to parliamentarians of all parties that the time for decision had arrived. It is to be expected that a House, which has talked endlessly of the Brexit clock being run down, was only too well aware of the passage of time. And its consequences. She could have expressed matters differently. Instead of sounding irritated with seeming stubbornness, she could have voiced explicit sympathy with those who are understandably wrestling with long-standing views or manifesto commitments or loyalty to one sector of society or another. In doing so, she could have placed herself on the side of parliamentarians, empathetic and comprehending, rather than in deliberate and, it would appear, provocative contradistinction to MPs. In a parliament, remember, which she needs to convince and cajole. She could then have set out her case for bringing those competing, conflicting elements to a close by endorsing her deal. To overcome doubts - as she herself has ostensibly had to do. Remember that she campaigned for Remain. Instead of cajoling, she criticised. Instead of urging, she irked. In politics, one has to judge the moment. Sometimes that moment will call for rhetoric, for blunt command. Sometimes, frankly, the moment will call for pleading, for persuasion. But set that aside. We are where we are, still stuck. The PM said, as things stood, she was still unable to bring forward her deal for a third Meaningful Vote. With a glance of only mild irritation towards the Speaker, she noted that his ruling stood: that the deal must be substantially changed if it is to face another vote. She promised such a development, if indeed it is to be attempted again, presumably involving the legal endorsement by the EU of matters agreed since the last MV, together with the new timetable for departure. In addition, the exchanges on her statement this afternoon featured an intriguing debate about the nature of democracy, governance and power. Firstly, the issue centred around indicative votes - by which the House might, in very general terms, signal what it might tolerate with regard to Brexit. Or, indeed, to its cancellation or subjugation to a further referendum. Then there was the question of the status of those votes. 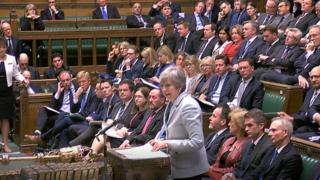 The PM made two broad points - although she made them so often in response to so many questions that it appeared like a blizzard of doctrine rather than a pair of relatively simple arguments. Firstly, she said that it would be wrong to place the holding of indicative votes purely in the hands of the Commons. The government must play a role, its status must be respected (remember that, ultimately, she is a minister of the Crown, not parliament). Secondly, and more significantly, she said that she could not commit in advance to implement, in detail and in full, the outcome of any indicative vote. No "blank cheque". This infuriated many MPs, notably Mr Blackford who wondered what the point was in turning up to vote in the House if those votes were routinely to be ignored. He made his point trenchantly and well. But it seems to me that the PM was addressing another aspect of this question, albeit she perhaps decided, on balance, that it would be diplomatic not to be too explicit. In essence, she was saying that a government - any government - had to observe and pay heed to Parliamentary votes. But had to temper those with what may be practicable and, even on occasion, legal. To be flippant for a moment, should ministers heed a parliamentary demand to launch a satellite around Saturn or to turn back time? To be serious for a further moment, should ministers heed a parliamentary demand on Brexit when they know that there is zero chance of the European Union implementing such a change? That it may, in short, breach internationally agreed law. In sum, this returns us to the conundrums which have dogged Brexit from the outset. Yes, the people of the UK as a whole voted to leave the EU. But they did so without any detailed instruction as to what, precisely, that involved and how the demand was to be met. Secondly, MPs, in seeking to implement (or indeed thwart) that demand of the UK populace, have consistently failed to appreciate the full extent of the role played by the EU institutions, the other half of what is an internationally negotiated treaty, not a decision solely of the sovereign Commons. There was more. Much more. Sharp exchanges between Mrs May and Mr Blackford on Scottish independence. He argued that the day was coming when the people of Scotland would vote for independence, as members of the European Union. She said that Scotland had already voted, in 2016, to remain within the UK. Incidentally, rhetoric aside, one might ponder gently that point by Mr Blackford about EU membership. What if, by the time of indyref2, Scotland is already out of the EU, along with the rest of the UK? Would the offer automatically be full, independent EU membership? Or might it rather be an interim solution, such as the European Economic Area? Or perhaps a further referendum on the issue of the EU? No matter, for now. There was the issue of No Deal. Mrs May still wouldn't rule this out. But one Labour MP, Kate Hoey, had the answer. No Deal, apparently, wasn't what we all imagined it to be. Indeed, it wasn't No Deal at all. Rather, it was leaving with "a different type of deal". That of World Trade Organisation rules. I expect that will resolve the matter admirably.